You already know that images and visuals make your content more shareable on social media. But you can’t just add any photo to your posts and hope for the best. Low-quality, blurry, or poorly edited images simply won’t cut it. 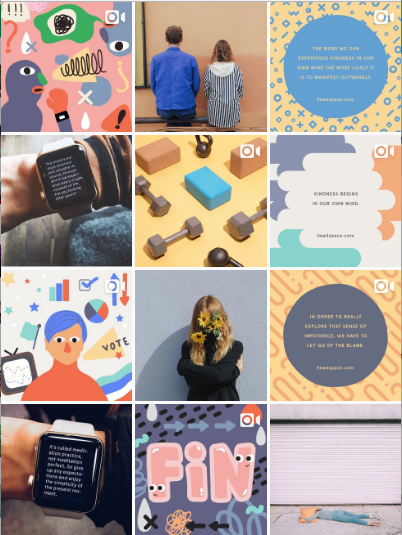 To make sure your social media strategy is being enhanced—not dragged down—by your visuals, we turned to Hootsuite designers Jocelyn Aarnoutse and Brenda Wisniowski for some expert advice. Bonus: Get the always-up-to-date social media image size cheat sheet. The free resource includes recommended photo dimensions for every type of image on every major network. When choosing color themes for image components such as text or graphics, you need to consider your brand. For best results, align colors with your brand guidelines and voice. For example, if you are a light-hearted, inspirational, and creative brand, using bright and cheerful colors is appropriate. If your brand is for rugged and outdoorsy types, you might want to choose an earthier palette to convey this. Headspace is a meditation and mindfulness app, and their Instagram color scheme reflects this calming brand characteristic. Rather than a distracting crayon box of colors, choose a palette that works for your brand personality and tone. There are many ways brands can use text and typography within their social media images. But it needs to be well-positioned and relevant text. Again, brand consistency is key. Just like with your color choices, typefaces need to reinforce your brand and work with your other branding. Consistency and familiarity lets your audience and customers recognize who you are and what you represent, which helps support brand awareness and loyalty. Another design tip for using text in your social media images is to make sure that when you’re laying text over a photo, the photo doesn’t have too many small details. Readability and clarity are paramount. With this in mind, our designers also suggest that you refrain from mixing typefaces as this can distract from your message. A brand that does this well on Instagram is Tightclub. They share relevant information alongside simple, yet on-brand images. You can easily add text to your social media images with Hootsuite Enchance. The free mobile app also lets you resize, crop, adjust colors, or add a company logo to any photo. Download here. “Less is more”—a proverb that’s especially true when it comes to social media images. All too often we see cluttered, busy, irrelevant, and all around terrible visuals being shared by brands on social. The core principles any brand needs to consider when sharing a visual are clarity and conciseness. Think about the simplest way you are able to get your message across. For Wisniowski, this means making space your friend. The interaction between positive and negative space is key. When you are creating visuals that are going to be placed alongside one another, in a sequence, or in a campaign, you want to make sure that the subjects of these images are clear. Using negative space (the area that surrounds objects in an image) helps bring balance and defines the focus of the visual. When there is too much information in one image, it’s easy for the message to get lost. Consider why you are sharing your image to social media, and what your key message is. Then, ask if your image choice accomplishes this. For example, if you want to highlight your product, make sure that your product is the focus of the image. Don’t include busy backgrounds or other overly-stimulating elements that could distract the viewer. Mastering the art of social media images can be tricky, but follow these key principles, and you can take your visuals to the next level. Want the best social media images? Get Hootsuite Enhance to easily find, crop, edit, and share photos to all your social networks. Get the free cheat sheet now! Click here to get access to the free cheat sheet in Google Docs.